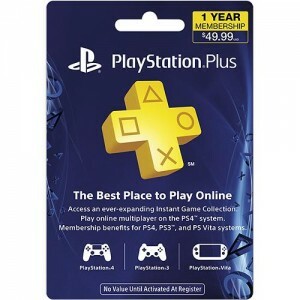 1 Year of PlayStation Plus is 20% off ($39.99) right now! Are you looking to renew or perhaps get a PlayStation Plus subscription? If so, I have found the deal for you! I don’t know how long it will last but right now, Best Buy has 1 Year PlayStation Plus membership cards on sale for just $39.99 which is 20% off of the normal $49.99. Even at full price, it is probably the best deal in console gaming when you get 2 free games every month for each of Sony’s major platforms (PS4, PS3 and the PS Vita), plus a ton of members only discounts on games, DLC and other content. I talked about how good of value memberships like PlayStation Plus is in a previous post called 8 Killer tips on how to save boatloads of cash on video games. If you are looking to get your gaming fix for very little money, I highly recommend checking out that post! If you want to know exactly what you are getting with the membership including what games you can get for free for this month, head over to Sony’s page for the service. Share this with any of your PlayStation loving friends and make sure to subscribe to the newsletter on the right so you can find out when new posts like this one are up and can save you money!